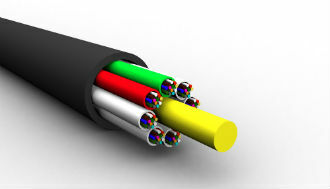 The Group has developed a 96 fibre microduct cable, which leads the way for small optical fibre cable designs. Cologne, June 5th, 2013 – Prysmian Group will present a new range of products to increase its offer to the telecoms industry at ANGA COM Exhibition in Cologne, Germany – June 4th to 6th. Prysmian has developed a new range of nano loose tube cables with smaller diameter and increased fibre density, part of the complete nano LT cable family offered by Prysmian Group, which allows the introduction of 192 fibres into standard 10/12mm ducts and 96 fibres into standard 8/10 mm ducts. Across Europe, more and more operators are adopting VDSL2 to boost copper network capacity from the last distribution point to the end user, using vectoring & bonding technology, which increases speeds on the ‘last mile’. To accommodate this, the need for more fibre capacity from POP to DP arises. In rolling out the required additional fibre capacity, operators want to use existing Right of Ways, including ducts/micro ducts. However, very often, the existing (micro)ducts are already filled to their maximum capacity. The new range of nano LT cables makes it possible to realise download speeds of 30-40 Mb/s on legacy portions of the network, whilst postponing investments in civil works and ‘last drop’ fibre, which typically spans 300 metres. Operators can invest in phases and decide to upgrade the final portion of the network at a later date. The Loose Tube solutions make the most of several existing Prysmian Group strengths. On basis of the bend insensitive BendBrightXS fibre, the Group’s cables make it possible to offer highest densities in confined spaces, without sacrificing quality and durability. Prysmian’s jetting/blowing know-how ensures the cable is properly distributed along distances up to 1.5 km. This new approach is ideal for operators and incumbents looking for new ways of deploying FTTH effectively and cost-efficiently, vastly increasing fibre density to accommodate VDSL2 and realising vast economies of scale. It allows them to reuse existing infrastructure, regardless of local requirements regarding cable type and quality. Excessive splicing can be avoided, for example, due to the high standards of the last-mile solutions. New product releases will enable compliance to specific local needs, for example by providing pre-connectorised cables. The company will be showing the new nano LT cables, together with its complete latest range of products, on its booth H35, hall 10.2.